CHICAGO – The Association of College and Research Libraries (ACRL) announces the release of “Academic Library Impact: Improving Practice and Essential Areas to Research.” Developed for ACRL by OCLC Research, this valuable resource investigates how libraries can increase student learning and success and effectively communicate their value to higher education stakeholders. The full report is freely available for download on the ACRL website. Now more than ever, academic libraries are being asked to demonstrate value to their institutional stakeholders, funders, and governance boards. 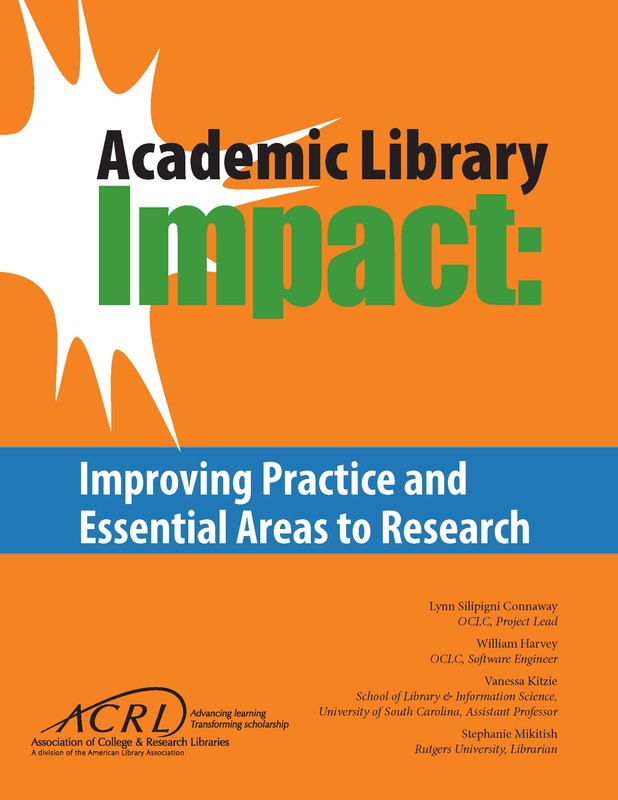 Academic Library Impact builds on ACRL’s 2010 "Value of Academic Libraries: A Comprehensive Research Review and Report" and the results of the subsequent Assessment in Action program. It demonstrates how libraries are now measuring library contributions to student learning and success, and recommends where more research is needed in areas critical to the higher education sector such as accreditation, student retention, and academic achievement. “'Academic Library Impact' captures the incredible strides made by the profession in assessing and demonstrating the contributions of academic libraries to the academy, and creates a path for moving us into the future via new research avenues,” says ACRL Executive Director Mary Ellen K. Davis. and a full bibliography of the works cited and reviewed. Building on established best practices and recent research, "Academic Library Impact" clearly identifies priority areas and suggests specific actions for academic librarians and administrators to take in developing programs, collections, and spaces focused on student learning and success. It includes effective practices, calls out exemplary studies, and indicates where more inquiry is needed, with proposed research designs. It identifies the next generation of necessary research to continue to testify to library value. This new report is a significant milestone for ACRL’s Value of Academic Libraries initiative and for the profession. The report is now available as a free PDF download from the ACRL website, and a print edition for purchase will be available through the ALA store website in October 2017. A companion online tool, “Visualizing Academic Library Impact: The ACRL/OCLC Literature Analysis Dashboard” helps librarians and researchers filter the existing literature for studies most relevant to their research interests and visually explore the literature and other data in the form of charts and graphs. The Association of College & Research Libraries (ACRL) is the higher education association for librarians. Representing more than 10,500 academic and research librarians and interested individuals, ACRL (a division of the American Library Association) develops programs, products and services to help academic and research librarians learn, innovate and lead within the academic community. Founded in 1940, ACRL is committed to advancing learning and transforming scholarship. ACRL is on the web at acrl.org, Facebook at facebook.com/ala.acrl and Twitter at @ala_acrl.